TEHRAN (Fut5al.ir) - Thailand was elected to host the Intercontinental Futsal Cup on August 27 - September 2. Abolfazl Khodabandehloo, the Iranian deputy executive of the tournament in Thailand, said that Bangkok will host sixth futsal champions in the Intercontinental Futsal Cup which will begin on August 27 in the capital city of Thailand. He added that Thailand Futsal Committee is fully prepared to host the thrilling tournament. Magnus Futsal of Brazil will defend their 2016 title in Bangkok. 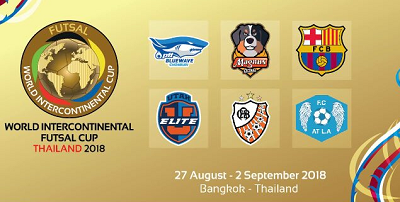 Blue Wave Chonburi as Asian champions, Barcelona as European invited club, Carlos Barbosa from Brazil, Elite Futsal as CONCACAF runners up and Los Angeles Atletico from Equatorial Guinea, invited for Africa. Giti Pasand of Isfahan, Iran's champions, missed the tournament after failing in the Asian Futsal Championship.